Primary baffle tube and focuser made by Astrosysteme Austria. Astrosysteme Austria (ASA) designed and produced the entire optical tube assembly (OTA) minus the primary and secondary mirrors, but including the flat-field corrector for the prime focus. ASA calculated the OTA specifics for the parameters of my home-made mirrors. 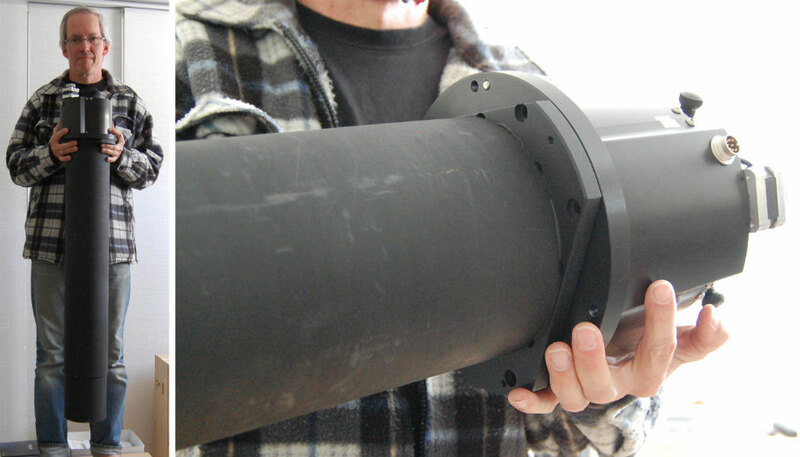 These specifics include the diameter and length of the primary and secondary baffle tubes. Shown here is the primary baffle and intergrated focuser.